Can you believe it? In a couple of weekends it will be the final session of the 2013 Christmas quiltalong - where did the time go! We're all having a grand parade over at QuiltSue's place, so I'd better get a wiggle on and get my Challenge project finished! I had a good decision making session today - however, as you can see from the pic here, my brilliant idea has only, at this point, translated into a string of unpicked-thread holes in the fabric. 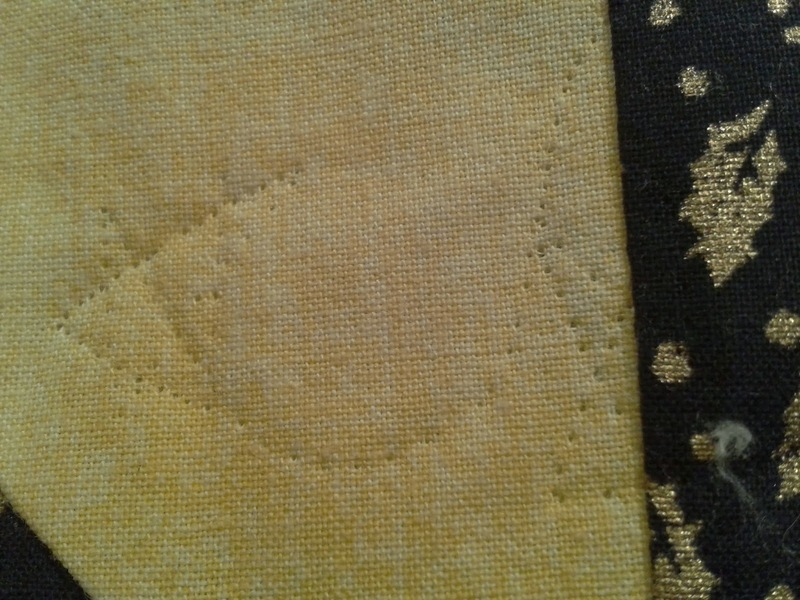 You never know, perhaps unpicked thread holes are going to be the new "thing" in quilting? Wouldn't that be good? What does it mean, "No comments". Who's stolen the one I left about 9 am today? What I actually said was along the lines of " perhaps you and I are starting a trend. 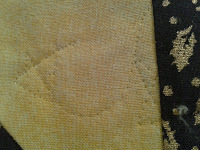 The unsewn holes in fabric are the very latest embellishment". I think that you are starting a trend in multiple replies, Sue! Tee hee! Yes, the time has flown by and I want it to slow down so I can enjoy every minute of this lovely Christmas season. Aren't we all experts at unpicking? Ha! Yes we are, Joanna! But nice to be good at something, even if it is unpicking mistakes! I'm going to ask, why did you unpick it as the holes look like a lovely design. Hope the next try is what you want and can't wait to see. Take care. The holes were in the right place, Sue, but the thread was not - but of a temporary tension issue going on there! I take then, from your comment, that the final parade of quilts for the Christmas Quilt-a-long will take place the weekend of the 14th and 15th? Yes, yes, Delores - we will see you this weekend I hope! Christmas QAL - Dec pt2 - Oh, I give up! Christmas QAL - Dec pt1!